Australians all let us rejoice! 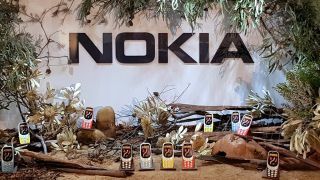 The new and improved Nokia 3310 is finally getting an Australian release, with the territory announced as the first in the world to get a 3G-ready version of the retro-tastic phone. Priced at a staggeringly-affordable $89.95, the Nokia 3310's removable battery offers 6.5 hours of talk-time and a whopping 27 days worth of standby time – perfect for taking with you to the beach or a festival. For that extra rush of nostalgia-induced fun, the Nokia 3310 will come with the classic Snake video game pre-installed, and if you're anything like us, you might end up using the whole battery solely on that. But of course, that's not all you can do with it. "You can talk, you can text, you of course can also tweet now, as it's 3G," said Pekka Rentala, Chief Marketing Officer at HMD Global. Available from mid-October 2017, you'll be able to purchase the Nokia 3310 from JB Hi-Fi, Harvey Norman, Vodafone and Optus in Azure (light blue) and Charcoal colours.